Who doesn’t love Oreos, right?! They are always my go-to indulgence as far as cookies go. A stack of Oreos and a cold glass of milk can make my whole day better! One of my favorite memories from college would be studying for exams with my best friend and eating a box of oreos while we crammed… clearly I’m a nerd since I look back fondly on studying, but it is so true. It was in those late nights that I felt like I learned so much, probably in part to the crazy sugar rush from all of those Oreos! 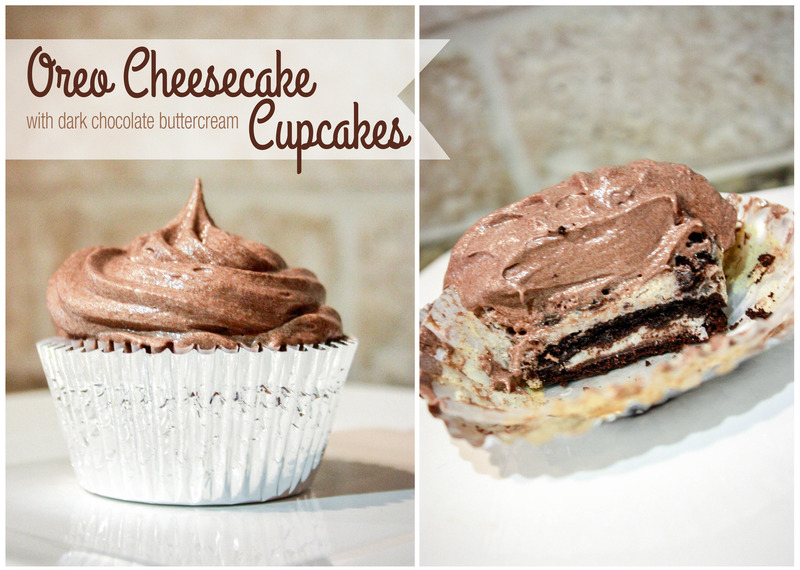 These cupcakes are light and delicious and, best of all, they have a whole Oreo in the bottom! Need I say more? It’s not an overly sweet cheesecake flavor, which goes really well with the Oreos both crushed and at the bottom (which also makes for a great surprise when you bite into them)! I paired the cupcake with a dark chocolate frosting, I love the combination of the rich dark chocolate and the light fluffy cheesecake.